Congratulations to Dave and John for their Championship wins! – Also don’t forget to book your seat for the Christmas Bash! Saturday 22nd December is the date to pencil in your diary, for the only party worth attending this festive season. has been arranged, with sit down at 7.30pm in the Summerhill Restaurant. The evening doesn’t end their though – there will be entertainment from The Tony Martin Experience, with Bar open until 1am. The cost for the evening, including entertainment and party favours is just £25 per person, and should you wish to stay overnight and enjoy a relaxing Full English Breakfast the next morning (served until 10.30am), the cost is just £25 per person based on 2 sharing a double or twin room. Simply call the hotel on 01983 400 500 to reserve your place, or alternatively text Steve your name and number of people attending on 07717 844767. Payment can be made by Friday 14th December. 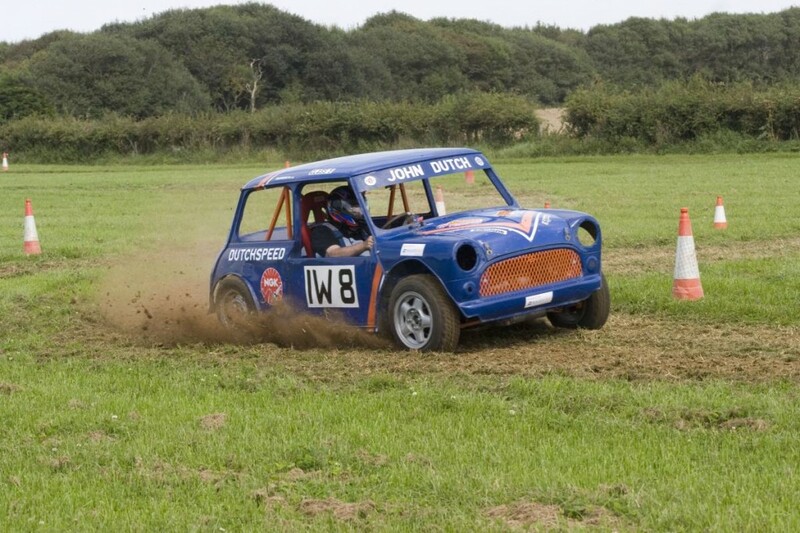 The final two rounds of the I O W Car Club Sealed Surface championship were held at BAE on Saturday and IW College on the Sunday. It turned out to be a titanic battle over the weekend to decide all class titles and the overall sealed surface title. It was to be an on going battle between Dave Dutch, Dave Goodwin, Toby Allen, Chris & Adam Greenen, Dave Bizzill and John Dutch for the fastest times, but from the start Dave Dutch in his DutchSpeed Modified Mini Pickup set the pace all weekend with increasingly quicker times to the point where he was 1.03 seconds ahead of the next driver Chris Greenen. This was a massive amount as positions are normally decided by tenths of a second. It looked like Dave was on a mission to let the others drivers know that the title was his and if they wanted it they would have to catch him first….Congratulations to Dave on a faultless drive all season. Conclusion to the 2012 Unsealed Surface Calendar! At the final round of the USS Championship held at Knighton sand pit on the 28/10/2012 John Dutch faced a strong challenge as it was close on points between him and Neil Glasbey, Darren Taylor and Steve Brett who also had one hand on the trophy but needed John to come lower than 5th place or have his car break down in this last round, but even though John was having a bad day he managed to get 4th place overall on the day which put him one point ahead of Neil Glasbey to win the title.. 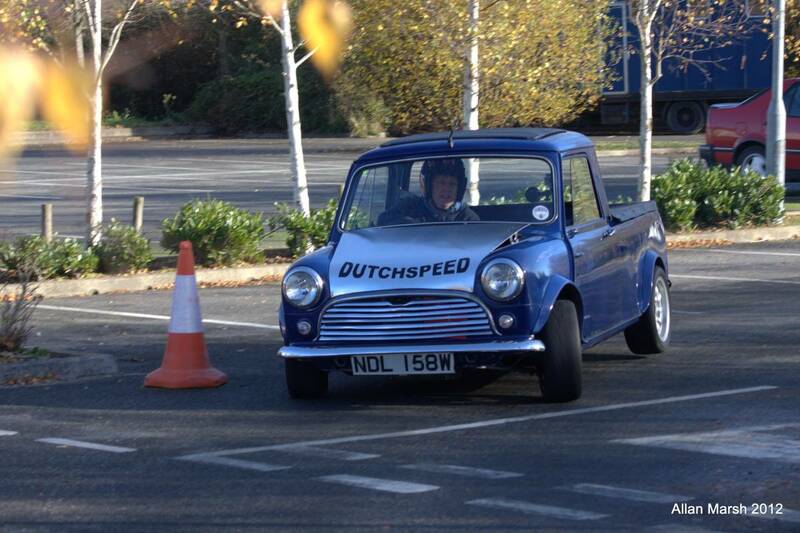 Although John in his DutchSpeed prepared mini only managed a fourth place in this final round he had collected enough points to Win Class 5 and also the overall (unsealed surface) championship title in his first full season competing in the IOW Car Club..
A reminder of all the forth coming events we have on! Healey weekend this Saturday and Sunday at BAE & IW college. Please if you can use the advance sign on through the website this is always a busy couple of events and the more done in advance the smoother things will run on the day. We will be signing day members on at these events however they will be on a 1st comes 1st served basis based on how many other drivers we already have signed on. Of course we will do all we can to let anyone who turns up to participate. Please can you ensure if you’re driving you follow the directions of the parking stewards and are there signed on and ready for 9:30. Saturday 22nd Melville hall hotel Sandown hosts the annual Meal and Disco, £25 per head for a 4 course meal plus disco. This is always an excellent evening, I attach the menu to this mail, booking is required directly to Steve at the hotel on 400500. Alternatively you can book and Pay at the Healey weekend! It’s that time of the year where your committee start to plan next seasons calendar, we already have a few idea’s of our own however if you have any suggestions please let us know – we can never have enough venues. What we do ask is that you let us approach the land owners so we can go equipped with the various papers and reassurance that our events present very little risk to their property! 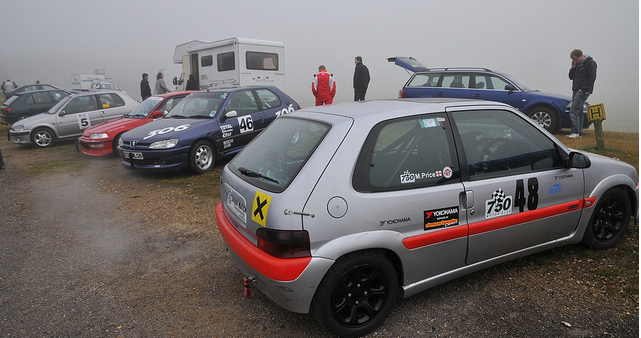 The early part of the day was shrouded in mist, but this did not deter the competitors from setting some solid times. 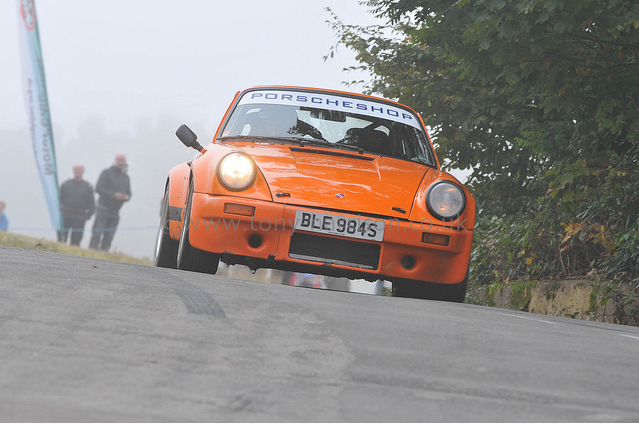 After the mist had burnt off, the times started to fall and by the close of play Will and Derek Thomas in their Porsche 911 had shown dominance and topped the leader board. Derek drove brilliantly to finish in 5th overall and 3rd in class (11) comfortable ahead of the chasing pack. 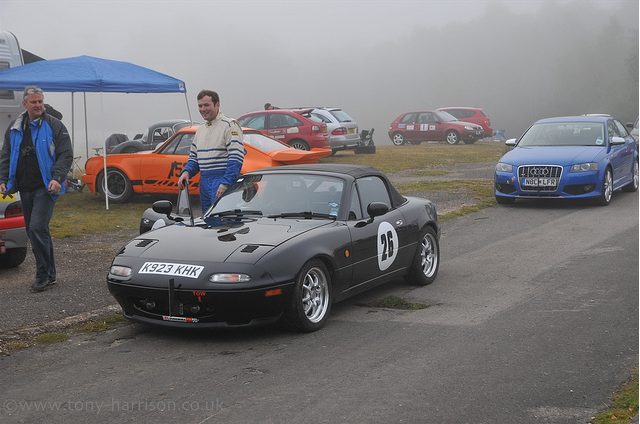 Toby Allen proved his mettle as normal and driving his Mazda Mx5 supercharged posted some excellent times, sadly not improving his personal best at this venue, but taking away some more useful experience and 13th overall and 2nd in class (5). Just behind him in 14th was Matt ‘Fiddler’ Griffin in his Honda Civic VT who came home a creditable 4th in his class (10), despite an altercation with the barriers (see video below) which fortunately left car and driver relatively unscathed. 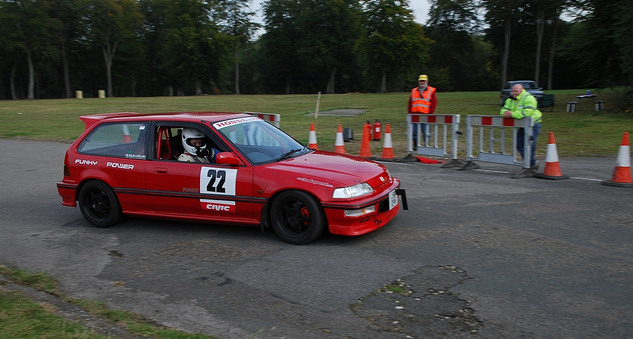 Darren Taylor, Peugeot 306 GTi6, also in Fiddler’s class drove well to 18th overall and 5th in class (10) ahead of Matt ‘Basra’ Price who finished 21st overall and 6th in class (10) making it a real duel between Fiddler, Darren and he as they jostled for class position. However, the man of the moment was Will Thomas who just dominated the event in the Porsche and came home with top honours overall and in class with fastest time of the day. Well done to the competitors representing the IOWCC, all of who finished well inside the top half of the final results and netting some silverware to bring home along the way.